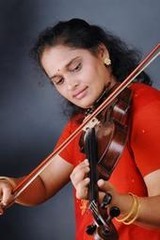 Instruments:	Indian Violin, Western Violin, Indian Viola, improvising technique, Indian vocal. Group Classes from 10 pounds. Individual classes from 15 pounds. Oppurtunity to perform at various national and international orchestras. Visiting lecturer to various universities in UK. About: More of me on www.indianviolin.eu and www.myspace.com/violinjyotsna. Great oppurtunity for all violin family lovers to get into the the fantasy world of learning violin and improvisation techniques.